Stress Is Your Friend • Run Hard. Rest Well. Too much stress and it becomes our enemy – out to destroy all we hold dear. 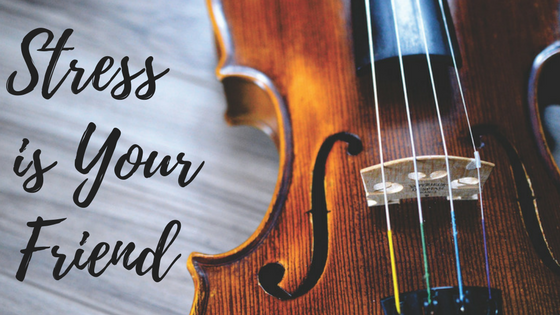 The strings of a violin need the right amount of tension to do what they were made to do. Too much tension, the strings snap. Too little, and there is no beautiful music to make or enjoy. We are moving into a season where stress runs rampant. Holiday preparations add layer upon layer of additional demands and expectations. The fear of “snapping” under the load is crushing and real. Take 14 minutes sometime this week and listen to Kelly McGonigal’s TED Talk on stress. Have a pen handy. You won’t be disappointed. What was your #1 take home? I took away that service to others can counteract any negative effects of stress. “Love the Lord your God with all your heart, soul, and mind. Love your neighbor as yourself.”Thanks! Karen, I found that very insightful, too. Much to think about. Thanks for sending this out. There are some gems in it.